This Belkin F6D3000 works with 802.11g and 802.11a wireless technology and offers fast data transfer speeds of up to 108 Mbps. 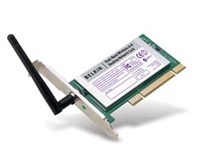 With the eXtended Range (XR) technology, this wireless PCI card doubles the coverage area compared to standard 802.11g and 802.11a networks. No me funciona con esos drivers……..